The Shree Mahamirtunjay Yantra is the yantra for healing, wellness and personal growth. It is also known as Lord Shiva’s Yantra and possesses immense healing properties. It should be used by those who have been diagnosed with an illness and the instructions should be followed to the letter for maximum impact. For those who are in good health, the Shree Mahamirtunjay Yantra will bring to you good, healthy and a long and peaceful life. At the planetary level, the Shree Mahamirtunjay Yantra, once “established” in your home with the proper rites and rituals, will protect you, your family and your home from the negative energy of the planets when they fall into a sequence that is not compatible with you. 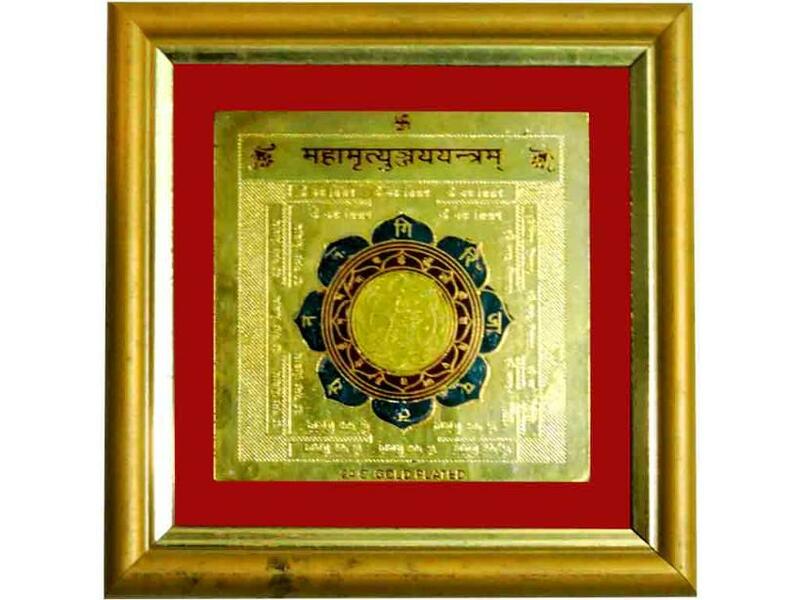 Perhaps the most well known quality of the Shree Mahamirtunjay Yantra is the fact that it protects those who own it from accidents and calamities caused by human error and nature. This alone is an excellent reason for you to own the Shree Mahamirtunjay Yantra. You should not just place it in your home but also carry it when you travel. Order the Shree Mahamirtunjay Yantra today and bring the blessings of Lord Shiva into your home. 4x4” size allowing you to keep the Shree Mahamirtunjay Yantra conveniently in many places in your home or office. Exquisitely crafted 24 ct authentic gold plating designed to give the Shree Mahamirtunjay Yantra an eternal shine and luster with an impeccable finish. Individually worshipped and made even more powerful by our astrologer through pooja, mantra and rituals before it is sent to you.